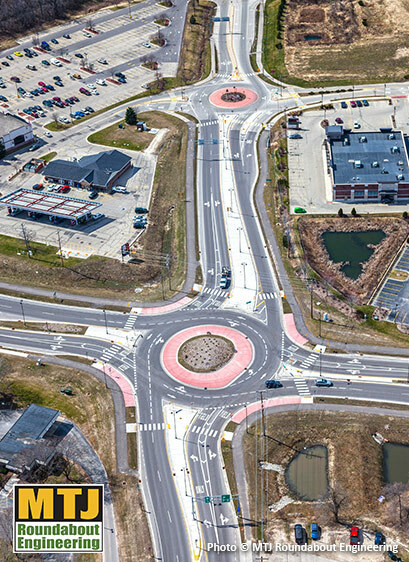 These two innovative, high flow, closely-spaced roundabouts provide an excellent, community-enhancing traffic solution for a particularly challenging site. 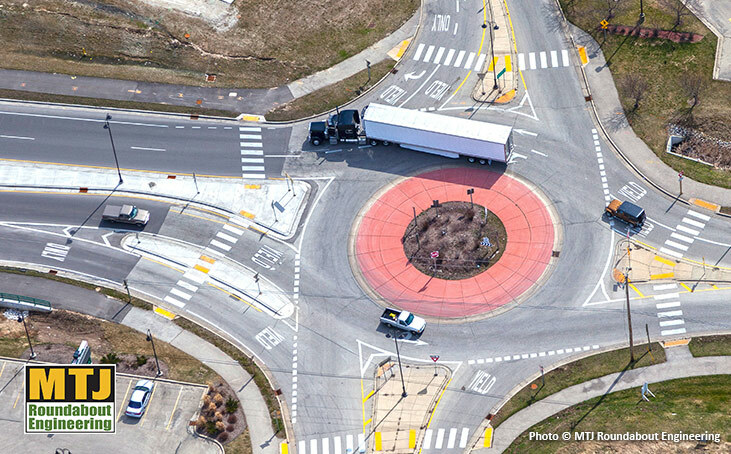 Located along a US highway, these modern roundabouts accommodate all users—from pedestrians to oversized trucks. MTJ’s innovative, site-specific design enhances business visibility & access, while preserving space for attractive landscaping. 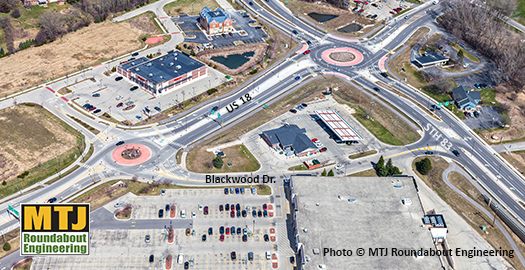 This roundabout project began with a single, compact 125’ multi-lane roundabout at the US 18 and Blackwood Dr. intersection. It opened in 2006 and successfully served a new commercial development. 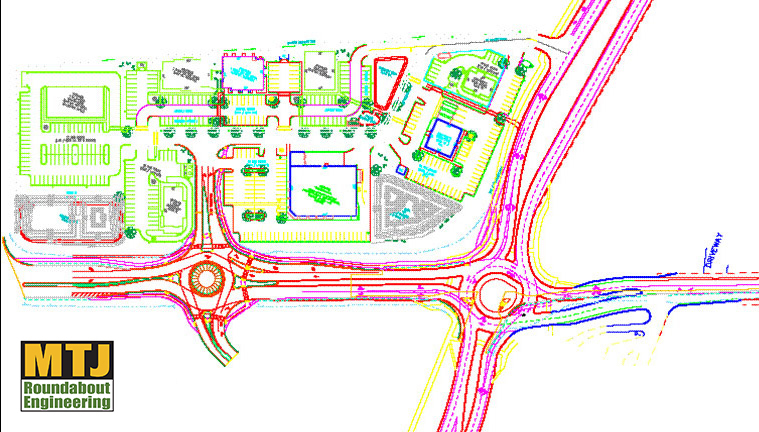 This first roundabout was expressly designed to complement a second, future roundabout. The goal of the second roundabout was to replace an antiquated, inefficient traffic signal at Highway 83 and US 18. When it opened in late 2015, traffic from the first roundabout flowed through without impediment—as projected by MTJ Engineering. Protect existing business from adverse impacts. Integrate site designs of new businesses into corridor designs. Create spaces for tasteful landscaping. The result: Seamless access to and from local businesses while maintaining high-performance traffic flow on these regional highways. 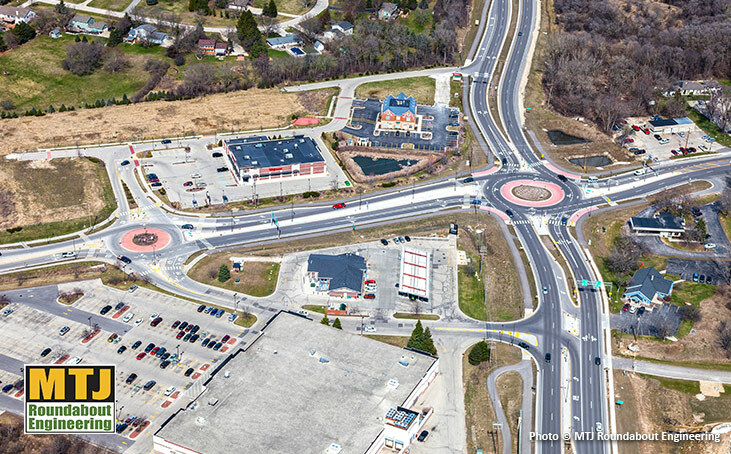 On cost efficiency: Though future Wisconsin Highway 83 widening plans were incorporated in the design, the efficiencies of this two-roundabout solution are already paying off. Widening expenses have been postponed; not from a lack of funds, but from a lack of need. 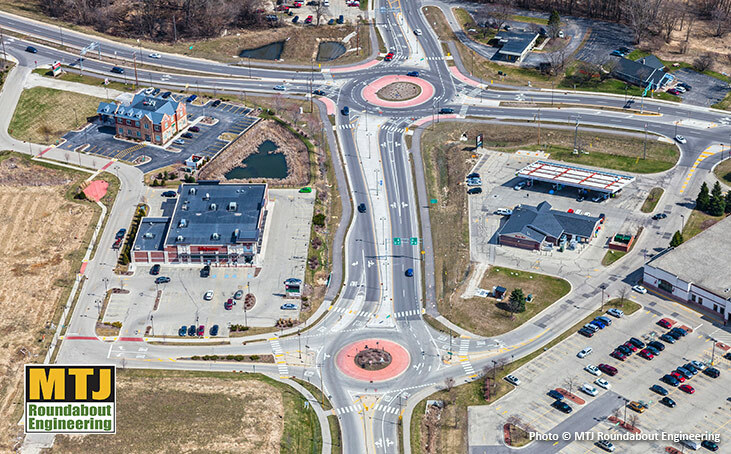 This project illustrates how modern traffic engineering principles—featuring the efficiencies of a roundabout—can improve traffic flow and safety, while enhancing community aesthetics and access to businesses. It would have been a much different picture if these intersections had been signalized. To achieve the equivalent traffic throughput of these two-lane roundabouts, a signalized design would have required six to eight lanes, minimum. Within a few short years the roads would likely need another expansion. The efficiencies of these roundabouts allow traffic to flow, even in rush hour conditions. And with the extra space, tasteful, community-enhancing landscaping can be maintained along the roadways. Our research has shown that business areas that combine good vehicular flow & access with aesthetics and safe pedestrian access will prosper and grow. That is why MTJ Engineering’s goal—always—is to better integrate traffic operations with all aspects of community vitality. 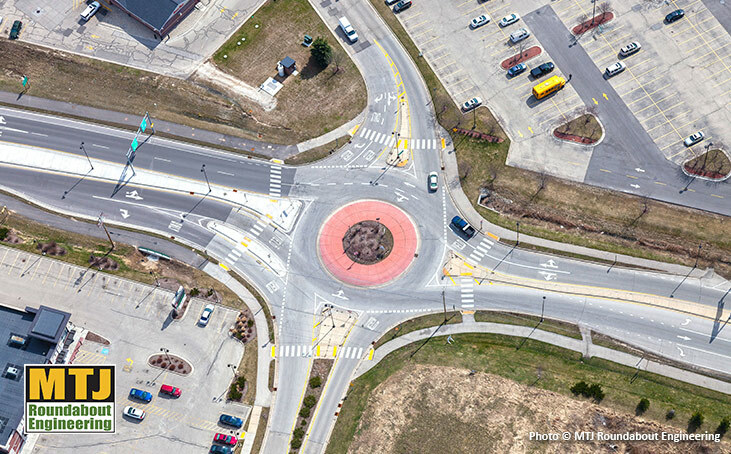 MTJ has 19 years of experience in creating successful roundabout projects. We incorporate the entire system in our designs. The unique context of a corridor is always at the forefront of our planning. The goal is to enhance access for all who use the roadway. Well planned and designed roundabouts can facilitate community growth without the costs and detrimental effects of roadway widening.